Date and Time: 19th November, 2018, 11 a.m.
Dr. R. Chidambaram, a renowned Indian Scientist and who was till recently Principal Scientific Advisor to Government of India, addressed students and teachers of various schools and colleges of Navi Mumbai on the occasion of National Technology Day Celebrations, which were held at Dr. K. M. Vasudevan Pillai’s Campus on Friday, 11th May, 2018. India carried out five nuclear tests at Pokharan on 11th and 13th May, 1998 and since then 11th May is celebrated as National Technology Day. Dr. Chidambaram stressed that “technology is power” irrespective of whether it is used to inflict injury to enemy, or to generate wealth or to generate and protect knowledge. If we want to be at the forefront, it is important to develop technology locally as western countries sell or pass on technologies to us only when they are obsolete for them. Dr. Vasudevan Pillai mentioned that there is a need to strengthen our educational system which did not receive adequate attention of the government during 1970 – 2005. The National Technology Day celebrations at Pillai College were organized by the Mumbai Chapter of National Academy of Sciences India (NASI) in association with Pillai College of Engineering (PCE). 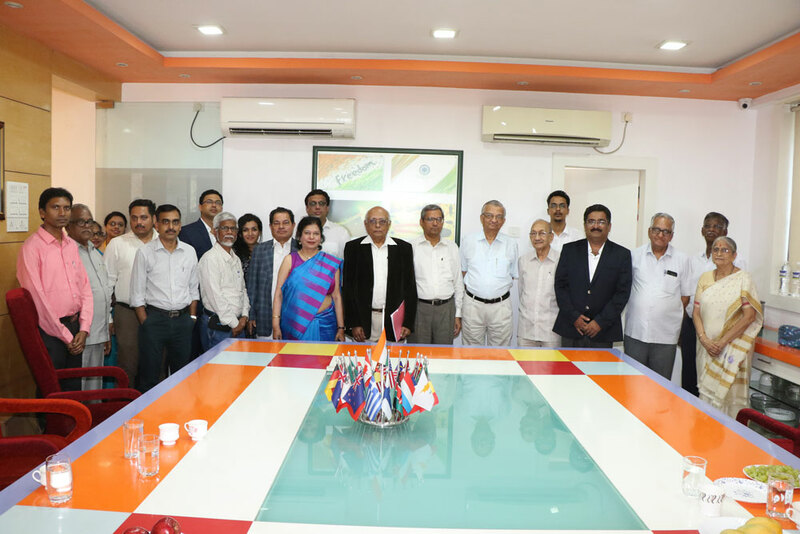 Dr Anil Kakodkar, President of NASI, presided over the function. The audience was thrilled on seeing both Dr. R. Chidambaram and Dr. Anil Kakodkar on the stage as they are known to be the architects of the nuclear weapon program in India. In addition to the above, eminent speakers, including Dr. Madumita Chatterjee from PCE, delivered talks dealing with latest developments in biotechnology and cyber security. Mahatma Education Society’s Pillai College of Engineering, New Panvel (PCE) and Indian Desalination Association (InDA) celebrated “World Water Day” at PCE campus on 24th March, 2018. There was One Day Seminar on “Integrated Water Management” which consisted of invited talks and presentation of contributory papers both in oral and poster sessions. In all, there were four invited talks and 18 contributory papers. The participants consisted of senior scientists/ professors and research scholars from several different institutes such as BARC, IIT-B, D. J. Sanghvi College of Engineering, Bharati Vidyapeeth College of Engineering, SIES, Nerul, Dr. Babasaheb Ambedkar Marathwada Univeristy (Aurangabad), Dr. Babasaheb Ambedkar Technical Univeristy (Lonere), Pillai HOC College of Engineering & Technology, Pillai HOC College of Arts, Science and Commerce and Pillai College of Engineering. There were few participants from the industry also. In addition to invitees, there were about 126 participants which included 69 participants from PCE. Prof. V. G. Gaikar (Vice Chancellor, Dr. Babasaheb Ambedkar Technical Univeristy, Lonere), who was the chief guest, delivered Inaugural Address. Dr. P. K. Tewai (President, InDA and Dr Ramanna Fellow, BARC) gave introduction about InDA, World Water Day and highlighted the importance of Integrated Water Management in the country. Dr. Sanjeev Katti (Senior Vice President, R & D, Reliance Industries) delivered keynote address and discussed about state of art desalination plants at Jamnagar Refinery. Abstract Book of the seminar and Souvenir of InDA were also unveiled. The inaugural function ended with vote of thanks, which was proposed by Dr. P. S. Goyal. Mr. Sriram Kulkarni (Director, Technochem Agencies, Mumbai) talked about Large Scale Desalination Projects in India-Limitations and Difficulties. Dr. M. V. Rane (Professor, Department of Mechanical Engineering, IIT-B) gave a talk on “Condenser Heat Recovery Desalination System” where he showed that heat of condensation, which is usually dispensed to the atmosphere, can be fruitfully utilized to desalinate water. The 3rd session (immediately after lunch) consisted of poster presentation of 10 contributory papers and display of six exhibits by first students of PCE. Both exhibits and the posters were received very well. There was a committee to judge the posters. InDA gave three prizes (1st, 2nd and 3rd) to the selected posters and also the consolation prizes for all the six exhibits. The 4th session consisted of poster presentation of 7 contributory papers. Again, there was a committee chaired by Prof. M. V. Rane to judge the quality of papers. Two prizes were given for best paper award by InDA. The seminar ended with the valedictory function, where Dr. R. C. Bindal appreciated the efforts taken by the college in making the seminar a success. He mentioned that the event was one of the best organized World Water Day functions and indicated that college is well equipped for organizing major conferences. Dr. P. S. Goyal (Convener) and a team of about 25 faculty members of PCE were involved in organizing the above event. Help and advice at different stages of organization was also provided by the executive members of InDA. The management of Mahatma Education Society (MES) was kind enough to allow the use of auditorium and other infrastructure at PCE. The expenses for the event were met from registration fee and partial grants from InDA and MES.